This fully furnished penthouse suite, centrally located downtown. Perched on the 12th floor, this airy and bright, one-bedroom condo with a queen size bed and hotel linen, features 8 ft. windows and 12 ft. ceilings. Living area with lounge, kitchen and dining space. With a click of the button close your shades for privacy, as well as blackout blinds in the bedroom. We loved the condo. 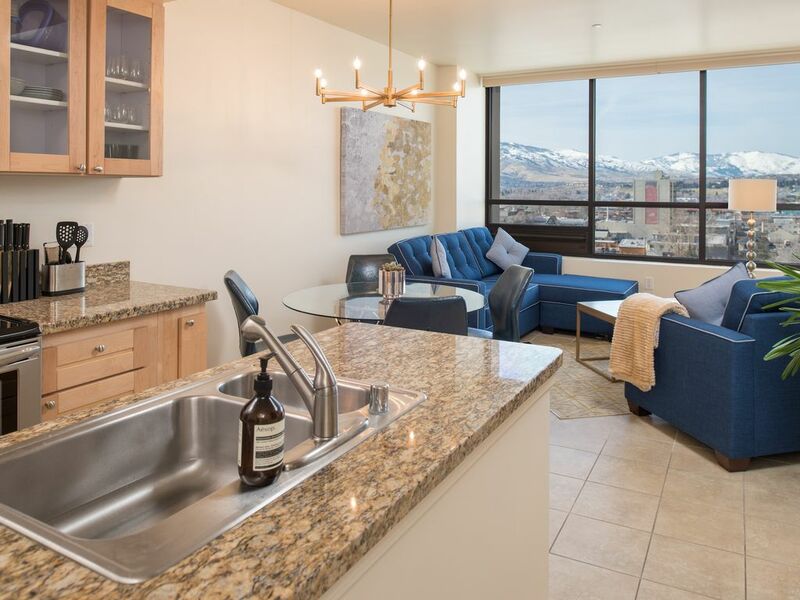 It was quiet, clean, private, centrally located in downtown Reno, friendly Security. Loved everything about it. Equipped with everything you need except refrigerator foods and necessities. Our next trip to Reno, we will stay here again. Owner was fast in getting back to us. They let us in the condo a couple hours early, upon our request. Wonderful, first rate suite. I will never stay at another casino hotel again. Beautiful view, quiet, conveniently located, and secure. Unit is well-equipped with everything you need. Thought bed was cozy. Owner is responsive and nice. Zero complaints. Would give more stars if I could. I was the envy of all at conference! Great apartment in a central location, would definitely recommend staying here and will be staying again in the future. Great condo, location, easy stay. I stayed here for about a week in November 2018. Overall I thought it was a great place to stay except for two things: 1) The bed mattress needs to be changed out. It sagged and was way too soft. A good tempur-pedic that lets people adjust the firmness of it would have been great. 2) Only other issue is that there are elevators on only one side of the building which meant a long walk if you came in the wrong door from the parking garage. Other than that, the condo had everything you could want, and I would consider staying there again if the mattress is replaced! Very good condo for two people. We really enjoyed the view overlooking Reno. The condo had everything we needed. We had trouble getting the TV to work, called the owner and he responded immediately.